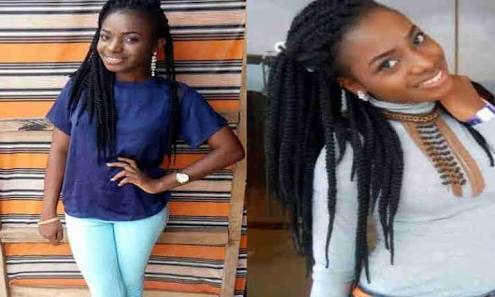 A beautiful student of Delta state University, Elozino Ogege, who was declared missing in the report we posted earlier, has been found dead, possibly killed by Ritualists in Delta. Her tongue and br*asts were severed from her body. Elozino is a student of the Department of Mass Communication. Her remains was found at about 2am by residents along Ekrejeta road in Abraka Community, Ethiope-East area of the state. Students in the area said she may have been killed by “Yahoo Plus Boys”. The Delta State Chairman of the Committee for the Defence of Human Rights, CDHR, Comrade Prince Kehinde-Taiga in a chat with Daily Post said the CDHR would champion calls for the redeployment of the Commissioner of Police, CP Muhammad Mustafa from the State if he fails to bring the perpetrators of the dastardly act to justice. Prince Taiga said the rate of ritual killings, murder, kidnappings, armed robbery, r*pe and other social vices had increased under the watch of the Police Boss in Delta.